AS IN: Keep it Simple, Silly. Everyone wants to write their sweeping 40-volume epic story with an ensemble cast of characters rivaling the likes of One Piece or Naruto. But that drive to clutter story with too many characters and too many cool elements is often a mistake of beginning writers. The true challenge is to simplify and distill the most important elements of the story and let those few bits shine through. Take a story like 3:10 to Yuma. Now, I usually don’t watch Westerns. I just didn’t find them that interesting. But when I saw James Mangold’s 2007 remake with Christian Bale and Russell Crowe leading – I’ve finally included one in my Favorite Movies list. The premise of this story is brutally simple but utterly compelling. One man needs to bring a convict to a train station but is having a hard time doing that. The movie was solid and I’m sure it’s because the screenplay was adapted from a short story by Elmore Leonard. Successful short stories often have a straightforward but still engaging narrative. The goal is crystal clear, the audience knows what’s at stake is with both characters and the obstacles in front of them, all the more trying. Are you having a hard time making people care about your story? Consider making it simpler and punchier instead of convoluted. Do you agree/disagree? Sound off in the comments below! Why else would you undergo voluntary manual labor? When I was a kid, I had a really hard time coming up with story ideas. Compared to my sister who seemed to come up with idea after idea effortlessly, I struggled to write up even a basic premise for a comic. I thought that was my shortcoming and that I just wasn’t creative or inspired enough. See creating something WELL takes a lot of time and effort. If you pursue it half-heartedly, it’s very easy to give up halfway. You’ll hit that point in the process where you feel lost, discouraged and overwhelmed, and you’ll definitely need something substantial to carry you through. If you’re not even sure why you make art, it might take you longer to find your way out of the dark. I think having a purpose to your work, like a guiding star, helps re-orient your thoughts and energies back into the project. If you’re passionate about your work, it also ends up showing in the end result. People want to support artists who bring something good to the table. They also want to feel like they’re getting something that could have only been made by you and your unique vision. Do you agree? Have you thought about how your creative projects are meaningful to you? If not, what would you like your work to say? 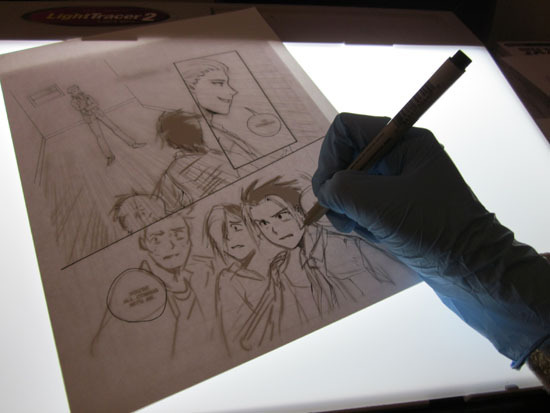 This post is part 3 of my blog post series, How to Run a Successful Kickstarter for your Manga. It’s a pretty cool, laid back crowd. Should be fun. Say hello if you’re stopping by! SIDENOTE: I’ve been totally preparing for this talk all week. And since I’m an anxious public speaker I decided to listen to this book, Nerve: Poise Under Pressure, Serenity Under Stress, and the Brave New Science of Fear and Cool . It’s about how people keep calm under pressure (like public speaking) and it’s just AMAZEBALLS! I had so much fun listening to the audiobook. I highly recommend picking it up if you’re into non-fiction stuff like me. I’ve been listening to The Accidental Creative podcasts for the past few weeks and really enjoying the productivity tips and strategies Todd Henry shares in his audio posts and interviews with some pretty cool people like Seth Godin. In today’s busy and demanding world, creative people have to be brilliant, prolific and healthy to survive in the long-term but pursuing all three of those feels incredibly difficult! There’s a ton of great info in his archives and I’m already eager to check out all the other books he recommends, too!